NOTE: This kit does NOT include the OEM RS4 airbox and our exclusive adapter like our other kit. It only includes a 4" cone filter adapter for you to use your own cone filter or modify your current intake system to work. Watch this Tune and Fueling Kit in action in the videos below! This Tune and Fueling Kit for OEM K04 Turbos features all of the parts to get the best performance out of OEM K04 turbos including quick low to mid-range boost response, hammering mid-range power, and very strong top end power. - JHM Stage 3 Tuning with up to 2 different programs (91, 93, 100). The first program is free and additional programs cost $100 each. - 6x 650cc EV14 Injectors with EV1 Style Adapters. These injectors are all STOCK HEIGHT for drop-in fitment. Each set of 6x injectors is balanced and flow matched to within 1% of the other injectors in the set. We use the stock 4 bar Fuel Pressure Regulator on our setup. - 1x OEM B5-RS4 Airbox featuring JHM modifications for increased airflow and optimal throttle response. NOTE: Our B5-RS4 Airboxes come with a stock air filter. - 1x 90mm Plastic MAF Housing with 4" cone filter adapter to mate to any cone filter of your choice and/or for you to modify your current intake to work with this MAF. - NOTE: Early B5-S4 cars with the Bosch MAF Sensor, will need to purchase a Hitachi MAF and wiring pigtail to convert the car to Hitachi. purchase SKUS 034-701-0000 and 06C133471A both available on our website. - 1x Upgraded, High-Flow (300+ lph) Fuel Pump with Adapter for Drop-In Fitment to 2.7T Fuel Pump basket. NOTE for Exhaust Components: For this tune and fueling kit to perform well, we recommend at least 2.5 inch downpipes paired with at least a 2.5 inch, true-dual, cat-back. For optimal performance of the kit, we recommend 3 inch downpipes going to a single 3.5 inch or 4 inch cat-back. We recommend 034Motorsport's Downpipes and 3.5 inch Cat-Back, both of which can be found on our website. NOTE for Intercooling Components: For this tune and fueling kit to perform well, we recommend at least having Evolution Racewerks Side Mount Intercoolers (ideally, with carbon fiber shrouds). 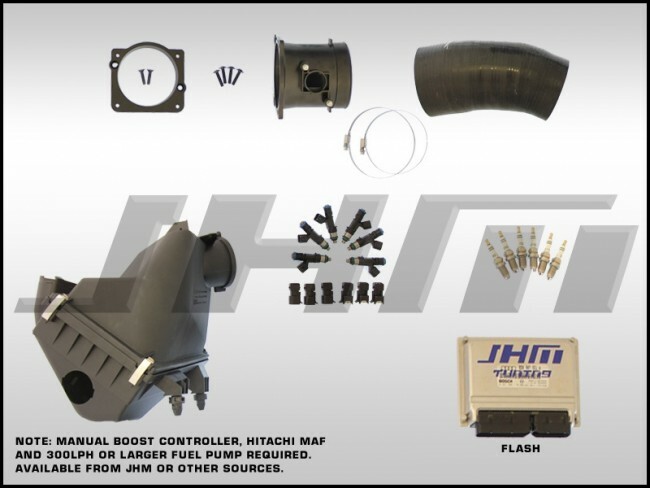 For optimal performance of this kit, we would recommend our JHM Front Mount Intercooler. Your can find both of these setups on our website. If you already some of the components in this kit, use the dropdown menus below to remove them from our complete fueling kit.